Sure enough the next day several people reported seeing the steer calf We called the number provided and a friendly woman told us the calf had jumped into her pasture and was hanging out with her older Polled Hereford cattle. So we loaded rails, wire and step in posts in the trailer. Three hours later we finally slapped five after we successfully loaded him back on the trailer Turns out Kelly and husband Frank had just moved to their new farm three miles from where #16 had escaped We enjoyed meeting them and talking about farm life. It occurred to me how lucky we are to be farming here in central Jersey with so many helpful, kind and interesting people nearby And maybe it isn’t time to throw in the towel and escape to a more manageable life. So thank you #16 for introducing us to some new folks. But don’t get any other ideas of escaping! Charlie fixed that electric fence charger too. 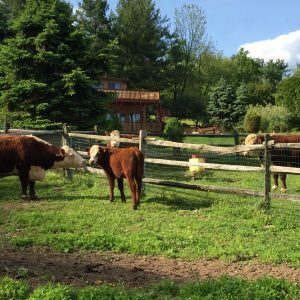 “Exclusively Grassfed” and “Grassfed Goodness” are slogans we use to describe out meat. But as I gaze down while walking our pastures I am amazed at the diversity of plants our animals are eating. In one square foot are a myriad of plants, all offering different nutrients and minerals. Plantains, dandelions, burdock, shepherd’s purse, ajuga, chickweed. 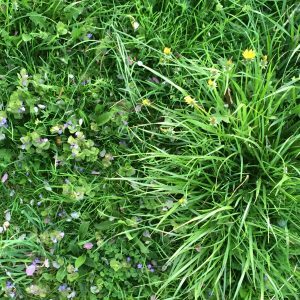 violets and a vast variety of clovers thrive in the field. All of these contribute to healthier soils and healthier animals. 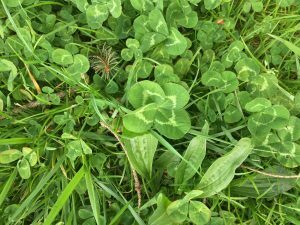 And speaking of clovers, very often I’ll find the four leaf variety!